Fold the pants up, cut the extra off and re-hem, keeping the original hem/seam. Picture shows a better example. If you are using a sewing machine no need to change out to a heavier needle either. Always use clear thread, like fishing line. It will last longer and you never need a color. 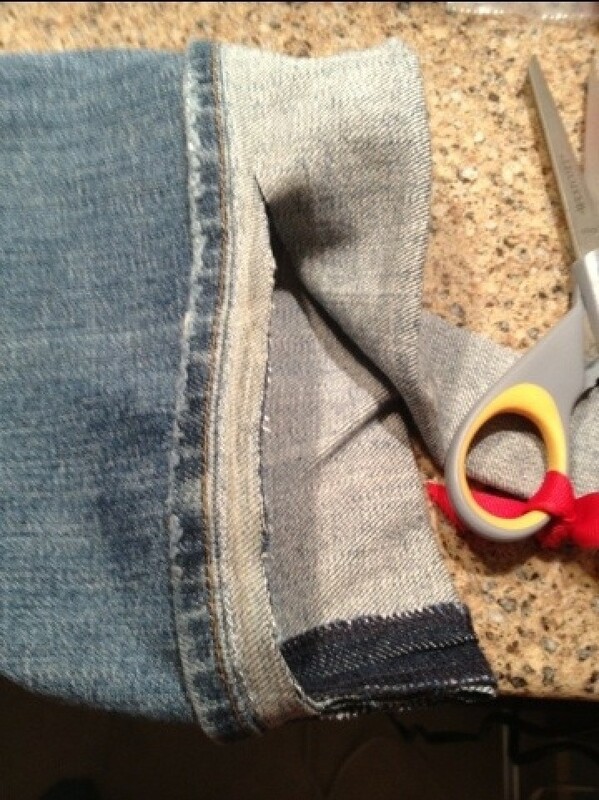 Are you saying to sew a seam reattaching the original hem strip to the shortened bottom edge? If so, good idea. Otherwise, I'm befuddled. Same here; don't get it. I don't see this as a good idea. You are still heming it but now you will see a line above the hem when you wear them. How does it not fray? Wouldn't it be easier to actually hem them? Even if you use stitch witchery stuff and iron it on. You see the original seam on the little strip? But the extra length has been cut away? I do the same thing, but I dont cut any of the excess length off. I just fold it up inside the leg of the pants, and tack in place with thread. You cannot tell unless you look closely. If people are looking that closely at your pants, then they really could use a hobby! Essentially after sewn back together they will look the same as before, just shorter. No more wet pant legs, or holes/fraying along the back. Yes, to real jeans people, an original hem or seam is extremely important. This is why you take measures to replace it. For a child it would be more appropriate to use this technique but not cut it and only tack it in place. For someone who will not get any taller, than this is a great idea, and a new seam being that close to the original hem will not be noticed.